Renowned paleontologist Robert T. Bakker and award-winning paleoartist Luis V. Rey combine forces in this oversized picture book about the evolution of dinosaurs. From the conquest of land by dino ancestor Acanthostega during the Devonian Period, through the mass die-off of dinosaurs at the end of the Cretaceous Period, Bakker and Rey take readers on a safari through time while paying subtle homage to the 1960 Giant Golden Book Dinosaurs and Other Prehistoric Reptiles that inspired them both as young dinophiles. With stops along the way to look at monster bugs, ferocious fin-backs, fluffy dinosaurs, sea monsters and the 12-year-old girl who discovered them, dinosaur orchestras, tickling tyrannosaurs, and much, much more, this is a journey readers will never forget. 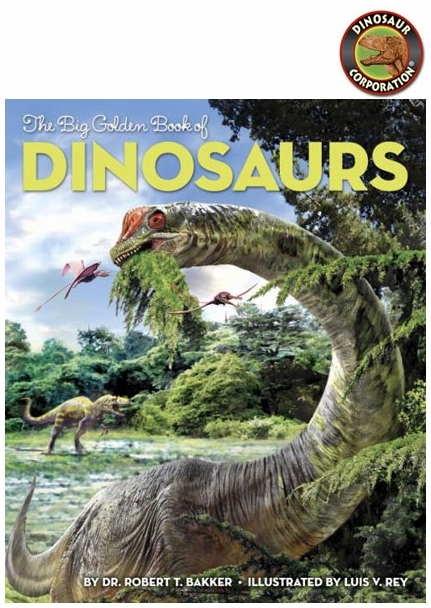 It's a perfect gift for young dinosaur lovers--as well as adult fans of Dr. Bakker and Luis Rey! * Author: Rey, Luis V. (Illustrator) Bakker, Robert T.